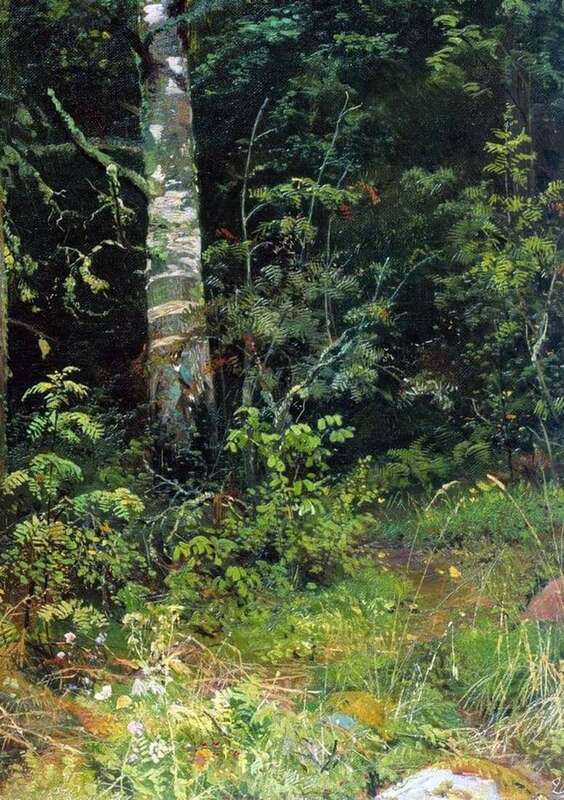 Ivan Shishkin, masterfully mastering the technique of painting, was able to depict a fragment of a forest thicket on canvas with almost photographic accuracy. The main elements of the forest component are birch trees and several low rowan trees. White birch in the left part of the picture attracts the viewer’s main attention. On its stalk there is a shadow emanating from neighboring branches and foliage. The branches of a birch are slightly overgrown with moss, and the overflow of a white tree trunk into a green shade of moss looks as harmonious as possible. Thin branches of a low rowan growing to the right of a birch, bend under heavy clusters of berries. Harvest of wild rowan is associated with disinterested and rich gifts of nature. Against the background of the two listed elements, rich forest vegetation can be seen. Dark green shades with yellow patches, implying the light of the sun, penetrating through dense vegetation creates the main background for plants in the foreground. The lightest parts of the canvas are grass and bushes, located closest to the viewer. Light shades of foliage and grass hint that the forest is illuminated by bright and warm sunshine, and the sky is clear. A bush of light, small mountain ash emphasizes the darkness and depth of the forest thicket, creating a favorable contrast between the two elements. White flowers at the bottom of the image are traced in great detail, they convey the purity and beauty of nature. The blotches of yellow and red colors bring variety and brightness to the canvas. Flowers and bright leaves frame the path leading deep into the forest. The thin stems of blades of white and yellow are directed upwards. Accuracy and subtlety of work gives the image greater realism, just conveying the boundless beauty of nature.